The Prophet Daniel was one of the four Great Prophets, along with Isaiah, Jeremiah, and Ezekiel. He lived about 500 b.c. and was born of the tribe of Judah. He was still a small boy when the Jewish people were carried off into captivity to Babylon, but was already renown for his judicious insight. The Babylonian King, Nebuchadnezzar, made him a prince in his court because he alone made a true interpretation of the King’s dreams. He also interpreted the meaning of the writing on the wall at King Belshazzar’s death. Daniel suffered for his faith in the One True God, including being cast into a den of lions, from which God delivered him. His friends, the Three Holy Youths, were cast into a fiery furnace because they refused to worship an idol of King Nebuchadnezzar. The Holy Prophet Daniel died peacefully in old age after a life of service to the True God Whom alone he worshiped and glorified. The scroll which St. Daniel holds in this icon reads, “The God of Heaven will establish a kingdom which will never be destroyed (Dan 2:44). 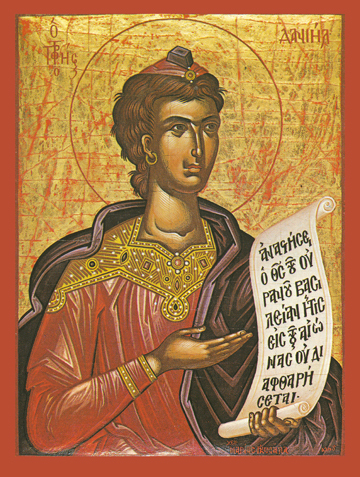 This is a contemporary icon by Maria Ginala.